The location of stripe-shirt-wearing picture book character Wally has been nailed down by cold hard algorithms. Where's Wally (or Where's Waldo in the US and Canada) books have inflicted eye-strain and brought tears and screams to kiddies since their 1987 debut, when the series first asked readers to spot the titular character amid dazzlingly-detailed cartoon vistas. Now data-fancier Randal Olson Randal Olson has created a machine learning system that works its way through the first seven Where's Wally books and quickly spots the character. 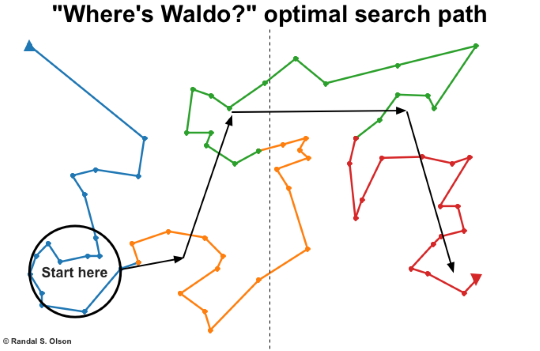 "I decided to approach this problem as a traveling salesman problem: We need to check every possible location that Waldo could be at while taking as little time as possible," Olson said in a post. "This was all done in good humour and — barring a situation where someone puts a gun to your head and forces you to find Waldo faster than their colleague — I don't recommend actually using this strategy for casual Where's Waldo? reading." Olson's platform found a reasonably consistent optimal path to Wally across the first seven books which tended to have a strong location bias. Hunters should start in the bottom left, ruling out the entire side if Wally was not found, before moving to the upper right quadrant and lastly dropping to the bottom right half. This path was established after about five minutes of running genetic algorithms which found the best route among a total number of possible paths numbering more than the total atoms in the known universe. Olson was quick to acknowledge that his time and capabilities could have been applied to more pressing endeavours. "As with so many things in life, the joy of finding Waldo is in the journey, not the destination," he said. However, he said his Wally-walloping ways were not so specialised that they couldn't pull off similar tricks in other books, or other applications.